Body Material 1.0mm/1.2mm/1.5mm cold-roll steel sheet/stainless steel/galvanized steel sheet/PP(polypropylene)/FRP(fiber reinforce plastic) all available. Plywood,MDF,HPL also can choice for the cabinet body. Worktop 1) 15mm/19mm/25mm thickness Epoxy Resin tops,black,gray,white color for option. 2) 13mm/16mm/19mm/25mm thickness Phenolic Resin tops,black, gray,white color for option. 4) 20mm thickness laboratory grade ceramic tops,black color. 5) 20mm/30mm/50mm marble tops,black color. a: All lab furniture worktop is chemical resistant,durable and anti scratch.UV light proof. perfect performance of chemical resistant like acid,alkali,chemical reagent,organic solvent. b: Lab grade ceramic top is able to high temperature resistant more than 1000°C and no affect. able to resist instant temperature 1200°C & there is no affect when temperature is up to 160 °C. c: Impact cutting resistant.monolithic smooth. 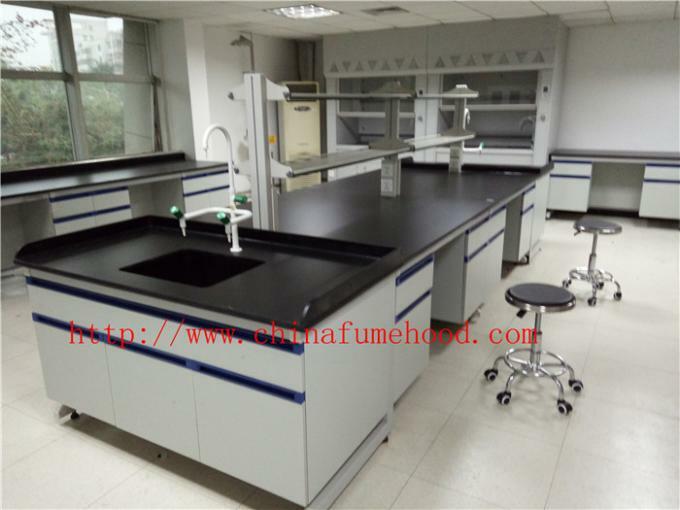 Cabinet For a better appearance and high efficient working station,we suggest lab furniture provide some cabinet.our standard cabinet size is 400 ×450 ×600,600 ×450 ×600.other cabinet size should be customized and approval. Handle 304# stainless steel/Aluminum/Plastic handle are available. Reagent Shelf Module steel column/Aluminum column,12mm tempered glass as the layer and other material board is optional,like epoxy resin,phenolic,marble,granite,stainless steel. Sink PP sink,epoxy resin sink,stainless steel sink all for option. Faucet Single taps/two way taps/triple taps for cold water,cold&hot water,pure water taps,sensor taps all is up to your choice.Stainless steel,material,brass body with ceramic valve ore with epoxy resin powder coating. Socket Water proof lab furniture socket, explosion proof socket,standard socket used in your country is for your option. Drip Rack Drip rack is up to your actual function demands,it's used in most of lab that located with water taps.customized size and material is available. 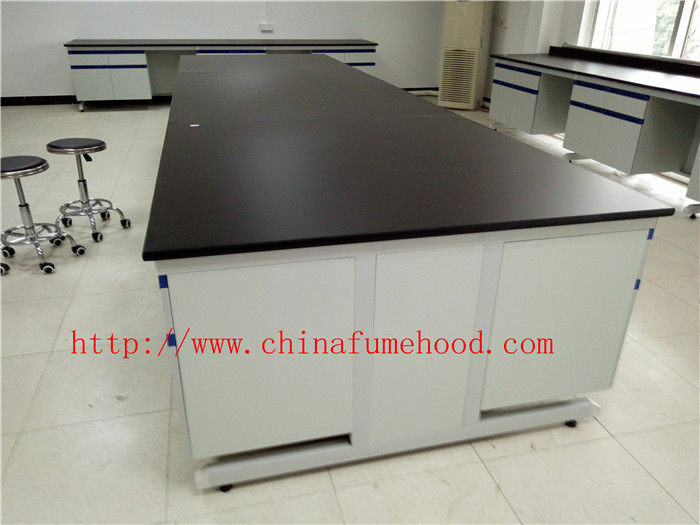 ♦ Laboratory Bench Width: The size of Width is based on design. 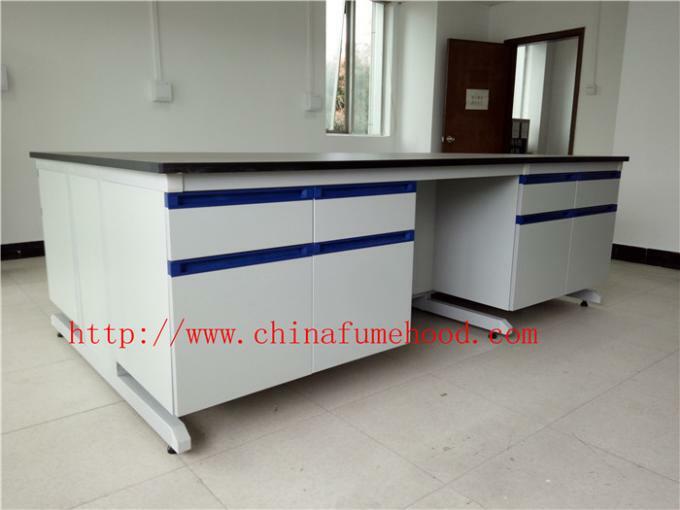 ♦Laboratory Bench Base cabinets: Quality 15 mm thickness melamine mdf board and eddge glue pvc eddge mm to proof water .The height of shelf panels can be adjustable according to different requirement. ♦ Laboratory Bench Reagent racks: Be made up of 1.2mm cold-rolled steel, covered with EPOXY RESIN powder static painting to resist acid and alkaline and stand heat. The height can be adjustable according to different requirement. ♦ Laboratory Bench Handles: Security shell-shape plastic handle or Strap-shaped handle made of stainless.